Do you know a ton of guitar licks and scales but struggle to make your playing sound truly creative? This is a problem most guitarists run into as they approach more advanced levels of guitar playing. Ironically, the way most people try to fix the problem only makes it worse. The common assumption is that you don’t know enough scales/licks/arpeggios/musical concepts and this drives most guitarists into an endless quest to “learn more stuff”. The problem with this approach is that it leaves many holes in your guitar playing and never addresses the real reasons why your creativity is not improving. Although learning new things is important, the REAL keys to creative guitar playing are: fluency, application, integration and mastery of the skills you already know. Beginner/early intermediate guitar players think of “learning the fretboard” in terms of rote memorization of individual note names on every string. This is a key reason why they get hopelessly lost when trying to play or improvise guitar solos. Good guitar players visualize the fretboard in scale shapes and learn to play or create guitar licks in one scale shape at a time. While this is better than being totally lost about what notes to play, this approach results in boring and very repetitive guitar solos. Great guitar players learn to visualize any scale across the ENTIRE fretboard. When they improvise lead guitar licks and solos, they don’t divide the fretboard into isolated chunks or shapes - they see the entire fretboard as one big scale pattern - from the first fret to the last. To get to this level of musical freedom, practice playing any scale you use in your lead guitar playing all over the fretboard. Don’t rush to learn new scales too quickly until you developed sufficient mastery and fluency with the scales you currently use in your guitar playing. To play creative lead guitar solos, you MUST understand which notes to use over any chord/backing track/song, as well as how to express specific emotions in your guitar phrases. Focus on HOW you play the notes, rather than on what notes you play. To get more emotion from each note, enhance it using vibrato, bends, slides or other creative phrasing techniques. To test how well you can currently do this, take this 2-minute lead guitar creativity assessment. Work together with an experienced guitar teacher who can help you understand which notes should be played over a certain chord and how to apply this knowledge creatively in your guitar playing. Instead of playing guitar licks/notes that merely “fit the chord”, focus on expressing real emotions when you play lead guitar solos. There is a profound difference between the two mindsets and it guides all musical choices you make when you improvise lead guitar. When you do not have a good “ear” (aural skills), you have no way of knowing how something will sound before you actually play it. This problem in turn makes it impossible to know how a note will feel before you play it. When you lack this skill, true musical creativity becomes impossible. While practicing scales, play slowly and sing every other note instead of playing it with your hands. Create guitar phrases by playing several notes on guitar, then singing the rest of the phrase (and vice versa). Observe the levels of musical tension created in different note choices by playing a variety of lead guitar phrases over the same chord. For example, record yourself playing an A minor chord over and over for 1-3 minutes. Next, improvise a variety of lead guitar phrases over it using the A natural minor scale, while holding out different notes over the chord. As you emphasize different notes of the scale over the same chord, focus on how the level of musical tension of your phrases builds and releases. As you improve with this, do this assignment with new chords and scales. Practicing guitar skills in isolation may help you improve those specific skills, but it will NOT make you into a massively better overall lead guitarist and musician. Why? Playing lead guitar creatively at a high level requires knowing how to integrate all of your guitar skills together. For example, if you want to become great at improvising lead guitar solos, you must work on many things: guitar phrasing, ear training, guitar technique, scales, arpeggios, fretboard visualization, and more. If you work on each piece individually, reaching your goals will take a painfully long time and you will always feel like something is holding back your ability to truly be creative. The fastest way to reach your musical goals is to practice in a way that integrates multiple skills or techniques together - enabling you to become truly creative with them. Learn more about how to practice in this way to improve your lead guitar playing by watching this free guitar practice video. When you apply the concepts of this article into your lead guitar playing, you will get on the right path towards mastering your musical creativity. To STAY on the path and fully master all skills involved in mastering lead guitar playing, work with a guitar teacher who has already helped countless guitarists achieve their musical goals and knows the best way to help you reach yours. 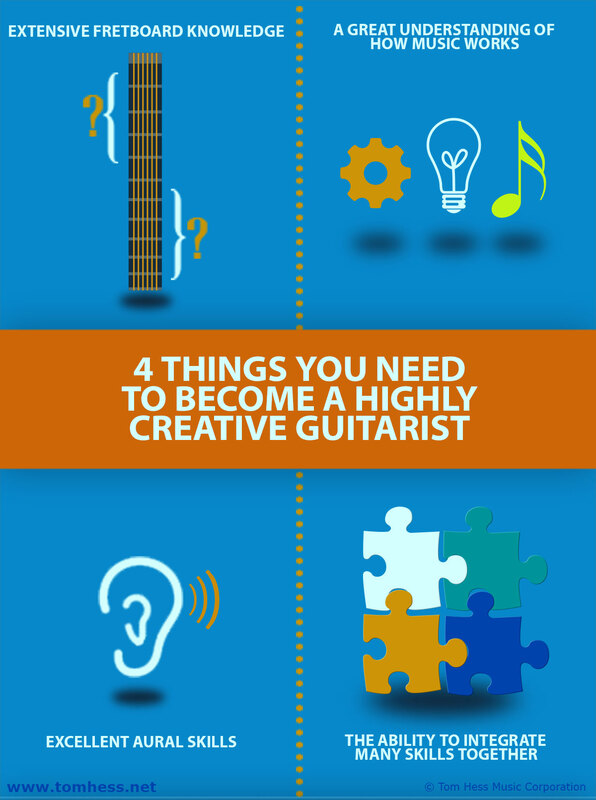 To find out exactly what skills you must improve to become a highly creative lead guitar player, take this 2-minute musical creativity assessment. After you complete it, I will reply to you with specific comments on how to improve your lead guitar playing. Get started taking online guitar lessons and play lead guitar better than you ever thought possible.